Feel like a lovely fresh dessert or a treat to accompany your coffee? 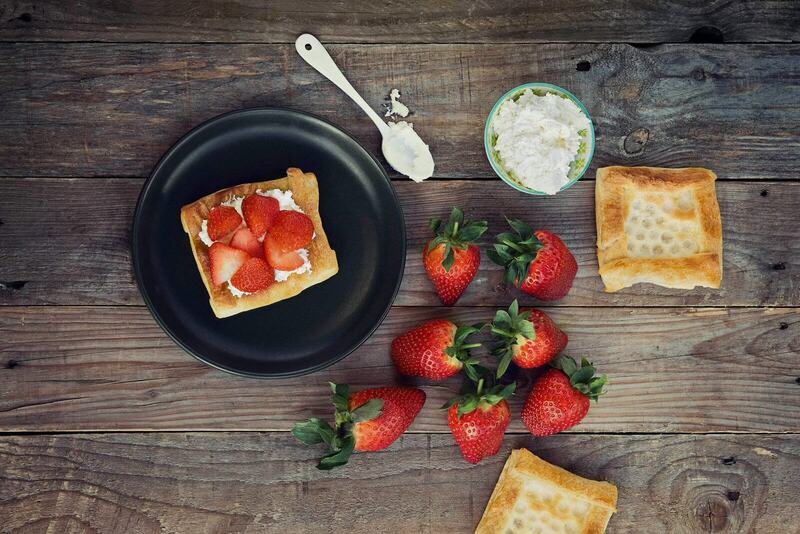 These strawberry barges have a crispy base, creamy filling, and a fresh topping. A delicious indulgence! Open the can of croissant dough and roll the dough out. Rub the diagonal cutting edges until closed. Cut the slab of puff pastry into six squares. Cut around 1 cm off the edge of the squares of puff pastry, and squeeze this pastry on the edge of the squares, creating a little container. Place the puff pastry barges on a baking tray that has been covered with baking paper and prick holes in the base with a fork. Fill the container with a support stuffing to make sure the base doesn’t rise. You can use the edible pearls or dried beans for this. Cover the edges with a little bit of milk or a beaten egg. Bake the barges for around 15 minutes in the oven until they are golden brown. Whip the whipped cream with the vanilla extract until it is stiff and mix the mascarpone through the mixture. Cut the strawberries into slices. Allow the puff pastry barges to cool down completely before you fill them with the mascarpone mixture. Divide the strawberry slices over the top.